Schema.org : where business and academia could meet! 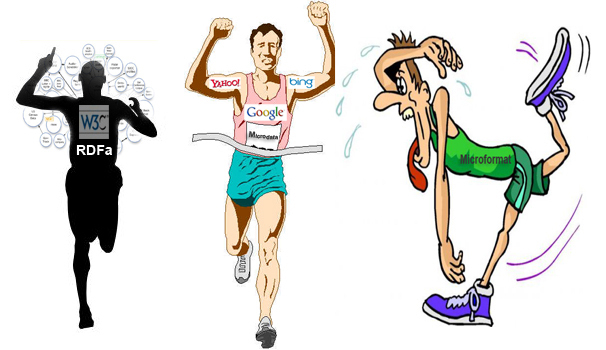 Recently Bing, Google and Yahoo! made an agreement to rely on a standard markup to improve the display of their search results, thereby making it easier for people to find the right web pages. They chose Microdata as annotation format to embed the types and properties of the content within the web pages. Microdata is a new feature supported in HTML 5 which provides a mechanism to allow machine-readable data to be embedded in HTML documents in an easy-to-write manner, with an unambiguous parsing model. Schema.org aims at providing a shared collection of schemas that webmasters can use for their Microdata markup. That sounds a great news. It can be considered as a step towards realizing the semantic web. Then, what is the problem?! There has been a long discussion in semantic web mailing list about this new announcement. Some people do agree on it as a progress to promote the semantic web efforts and some people criticize it as a new revenue model for the web monsters. In this post I wanted to publish my thoughts about Schema.org approach. The first question which comes to my mind in this context is: Why Microdata? Why not RDFa or either Microformat? I don’t think it is a good reasoning for a pragmatic decision. Simple is not always the better! As Samuel says, while there are a number of technical merits that speak in favor of RDFa over Microformats and Microdata (fully qualified vocabulary terms, prefix short-hand via CURIEs, accessibility-friendly, unified processing rules, etc. please take a look at this to see that RDFa is not really so complicated! ), the main point is realizing of centralized innovation vs. distributed innovation. The web has always relied on distributed innovation and RDFa allows that sort of innovation to continue by solving the tenable problem of a semantics expression mechanism. Microdata has no such general purpose solution. Although it can facilitate one specific problem like searching data, it is not well scalable with the vision of semantic web. Schema.org as a centralized solution for web of data is really in conflict with the vision of making benefit out of distributed information islands. I wish they could make a better decision to speed up realizing a web of knowledge! Schema.org – Threat or Opportunity?